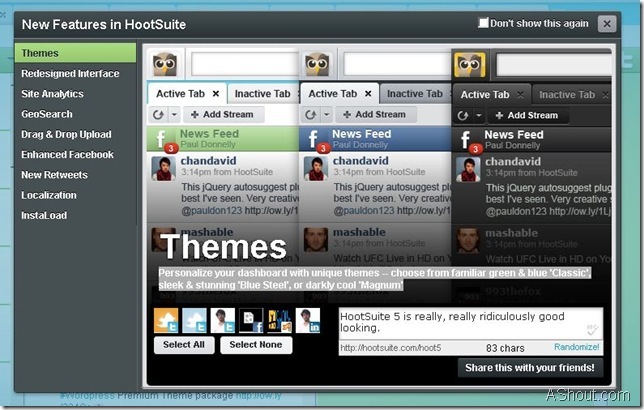 HootSuite today launched it’s new versions of HootSuite and named it has HootSuite5. HootSuite is a one of the most popular professional twitter client. If you are a regular twitter user, then you may know about HootSuite. In new version of HootSuite webapps they made really nice improvements in design and added some good features. As like you, I’m also one of the daily HootSuite user. Today when I logged into my HootSuite account I’m welcomed with a Pop-up message saying New Features in HootSuite. The above image is the welcome message what I got when I logged into my HootSuite account. I’m really surprised to see that message regarding new features in HootSuite. The main thing you notice in New Features of HootSuite is new Themes and best thing is they removed Footer ad and increased the space, this is the most annoying thing what I face in old version of HootSuite. Thanks for remove it. See the new look of HootSuite, also observe footer, now you don’t see Apps ads. Drag and Drop: Now you can upload any image through HootSuite by just drag and dropping image to HootSuite compose box. InstaLoad: They also worked on speed, now you can load tweets even faster when compared to old version of HootSuite. They used HTML5 to achieve this task. 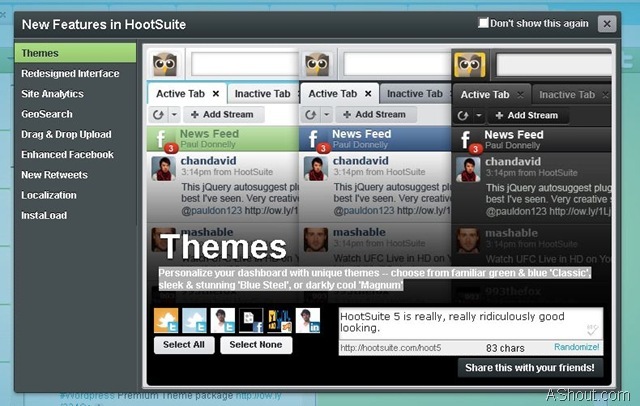 And more and more features are available in new HootSuite. If you not yet seen new version of HootSuite (HootSuite5) then go and login to your HootSuite account you will see the new look. Thanks for spreading the HootSuite5 word — we hope you enjoy the news features. Just hear about HootSuite5. Hope you enjoy with it .